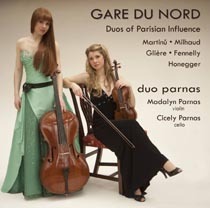 duo parnas’ second recording is a collection of fascinating and rarely-heard violin/cello duos written by 20th century composers each with a “Parisian Influence”. Martinu, a Bohemian Czech composer, wrote his first duo in Paris. Though Swiss, Honegger lived most of his life there, attending the Paris Conservatory with his thoroughly French colleague Milhaud. The Ukrainian Glière changed his name from “Glier” to the French-sounding “Glière”. And, Fennelly’s ’Sigol’ for Two is dedicated to granddaughter Sigol who lives in Paris. The busy Parisian train station seems a fitting metaphor; these pieces converge on Paris in various ways from many places as do rail travelers on “Gare du Nord”. The resulting collection is sumptuous. Enjoy!